In Northwest Arkansas, innovation sits at the top of everyone’s to-do list. Walmart wants it. Suppliers want it. Consumers want it. Millennials require it. We in NWA have a jewel in our midst — an innovation jewel, an Emerald City of sorts. And while that gem is reflected throughout the entire community, it shines especially brightly in Fayetteville. Not only is the McMillon Innovation Studio located there, on the University of Arkansas campus, the city’s downtown square has become a hotbed of companies that are innovators. This includes Startup Junkie Consulting, Community Venture Foundation, Hayseed Ventures, Zenworks, Metova, LineGard Med, Overdrive, Lofty Labs, Simply Measured, RiffRaff and Moniker Ferments. There are other cool innovation and creative-support organizations, too, like the New Design School and the Fayetteville Chamber of Commerce’s FabLab and Robotics Training Lab. And keep in mind that in 2017, the University of Arkansas Global Campus on the Fayetteville square will be the new home for the UA Innovation and Entrepreneurship program. Don’t be misled into thinking that it’s just brands and service companies that meet the challenge of new ideas. Even the nonprofits here are innovative, like the Northwest Arkansas Food Bank. It just enlisted the help of the Rogers Police Department to distribute food to hungry people in our area. In addition to the police being uniquely positioned to be able to recognize someone needing food, this partnership gives our food bank an additional agency that is a highly relevant source to distribute food. So, with its new season, “Focus on Suppliers” is introducing a feature titled, “The Innovation District.” The segment will be hosted by Jeff Amerine, CEO of Startup Junkie Consulting. Each week, Amerine will meet us on the square and introduce us to one of the innovators in our area. They’ll talk disruption. They’ll talk better systems. They’ll talk new and improved. The show regularly broadcasts weekly on KNWA-NBC at 6:30 p.m. Saturdays and 5 a.m. Sundays. Innovation – Learn how new products are developed and marketed as well as ways to reduce costs and have operations run more smoothly. “Retail-tainment” – Great examples of enhancing the in-store experience and getting shoppers engaged. 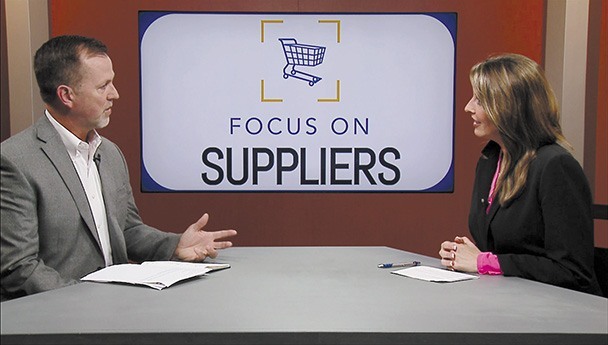 Sam’s Club – Experienced Sam’s Club Inc. suppliers discuss the nuances and offer guidance for working with Sam’s Club and the club channel. Pets – Learn how the success of this high-growth category can be applied to other categories. Hunting and fishing – Suppliers discuss everything from seasonality to packaging to logistics. Toys and holiday – Toy makers, holiday food suppliers and live coverage from the Bentonville Toy Show make this an annual favorite. E-commerce – What’s happening right now in e-commerce and how to make the most of these opportunities. 2016 countdown – Retail experts give insightful comments on the leading trends of the past year. Full episodes and extended interviews can be found online at YouTube.com/c/8thandWalton and Vimeo.com/FocusOnSuppliers. Currently scheduled guests and episodes are subject to change.